Instructions: Finished card size is 4 1/4" x 5 1/2". Cut 2 - 4 1/4" x 5 1/2" panels from yellow cardstock, glue one to front of card base and one to inside of card. Cut panel from patterned paper slightly smaller than the blue frame, glue to front of card. Using hand-stitched frame dies, cut a frame from blue cardstock, glue to front of card with foam dots as pictured. 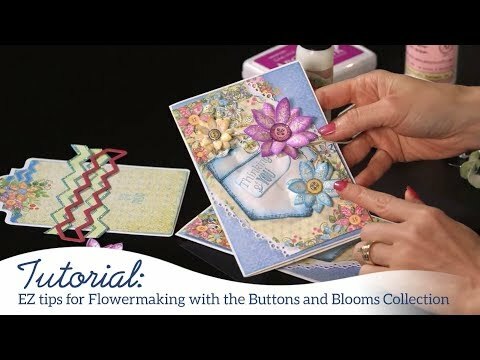 Stamp buttons and blooms on white cardstock, I used several colors to coordinate with the images on the patterned paper, cut with coordinating dies. Stamp quilt patchwork patterns on white cardstock, cut with coordinating dies, using same color inks shade flowers, buttons and patchwork patterns. Stamp leaves on white cardstock with Leaf Green ink, cut with coordinating dies, shade with same color ink. 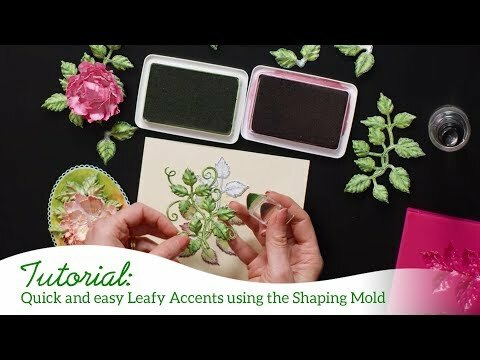 Shape large leaves with coordinating 3D Leafy Accents shaping mold. Shape small leafy branch with flower shaping kit. Glue leaves. Glue buttons on flowers. Glue patchwork and flowers with foam dots for dimension. Cut a panel from patterned paper, ink edges with vibrant fuchsia ink, stamp sentiment with cobalt ink. Cut an ornamental tag, cut tag apart using only top and bottom decorative edge to frame the top and bottom of the sentiment panel. Glue diecut pieces as pictured, glue panel to inside of card as pictured.